The fifth comet discovered by Terry Lovejoy, an Australian comet hunting amateur astronomer. Discovered on August 17, 2014 using his 8 inches reflector telescope. At a high orbital eccentricity and inclination (about 80 degrees, almost perpendicular to the ecliptic plane). It is most likely a comet originating from the Oort Cloud, which traveled millions of years across space before entering our Solar System region. 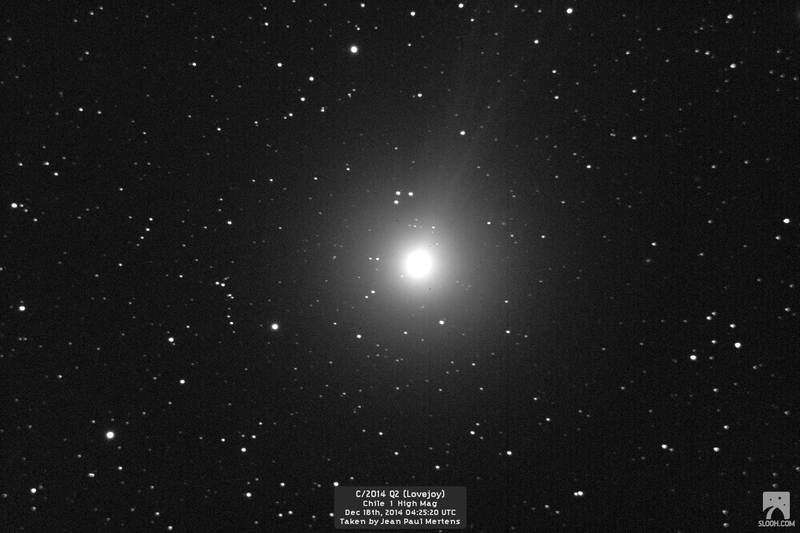 The current orbital elements computation, Comet C/2014 Q2 Lovejoy will reach its perihelion on mid February 2015) passing at a minimum distance of 1.78 Astronomical Units from the Sun. The minimum distance from our planet will be around 20 January. The comet's magnitude is expected to be around 4, so it will probably visible on a dark site with the naked eye. 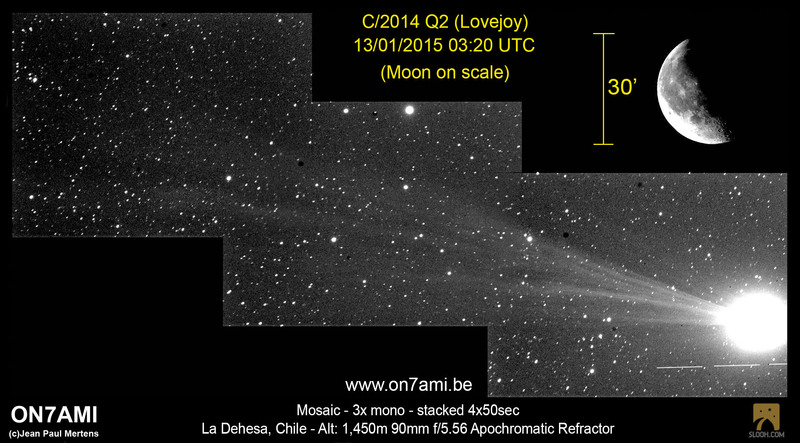 The comet C/2014 Q2 (Lovejoy) Visual tail length now 6x diameter moon. 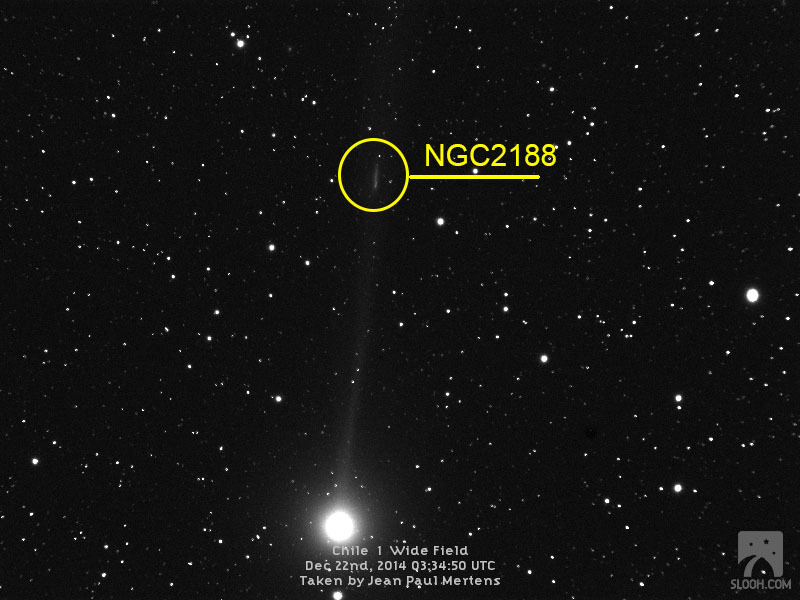 Comet C / 2014 Q2 (Lovejoy) with in its growing tail the galaxy NGC2188 (fine line) this night from the southern halrond. 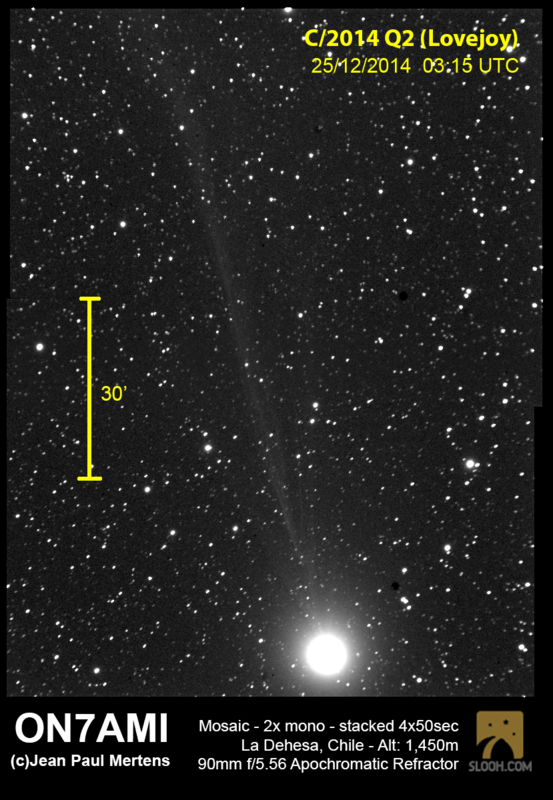 The comet C/2014 Q2 (Lovejoy) approaches the sun. Distance of the comet from the Sun is currently 1.4 times the Earth-Sun distance, the distance from the earth to the comet is 0.6 times the distance Earth-Sun. It can be seen already developing a clear tail. Currently the comet is only visible in the southern hemisphere of the earth, in January they will also be visible from our region.